A person who knows the basic facts of lending knows that mortgage loans are the easiest loans in the world to make. Why? The first reason is that the lender has two avenues for repayment. The lender can rely on the collateral and the borrower. That makes repayment more likely. This makes mortgage lending easy, and you need to know nothing more to know the way to plan the future of Fannie & Freddie. Not convinced? Consider a car loan. It has some of the same features as a mortgage. It has collateral, but of lesser quality. The collateral can drive away and may be difficult to locate and it loses value quickly. When you seize a home its value is more certain than that of a car, but the legal process of seizing the collateral is lengthy. Both loans have collateral advantages and both loans are much less risky if the borrower makes a large down payment. Eliminate the downpayment and you start a credit bubble. The balance on a car loan is small so it’s a hassle to get money on the street. The primary and difficult job of a banker is to make loans to persons who repay. You have to make a whole bunch of car loans to get to one mortgage loan. The car loan is too much work. 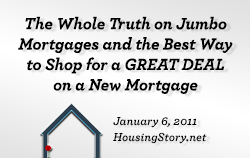 That’s another reason mortgage loans are the easiest when you compare them to car loans or even credit card loans. A credit card is inferior to both the car and mortgage loan because there is no collateral beyond the borrower’s promise to repay. If the borrower’s income changes the promise to pay back may lose its meaning. So the mortgage loan is safer and easier to make because it is easier to collect in the case of job loss. The key risk reducer inherent in mortgage loans is the collateral. It doesn’t lose its value when the borrower has financial difficulties; except for the cases when the borrower trashes or burns the house on the way out. You sell the house to pay back a defaulted loan. If a black-swan credit-bubble crash kicks in and it’s a 100-year-severity financial crisis, then adjustments must be made. Now down is up and right is wrong. All bets are off and all reason is gone. What should we do with Fannie and Freddie? A government should only grant monopolies in the rare instances where they are required. This rule tells you everything about planning the future of Fannie and Freddie. A monopoly is required for roads and bridges because competition is senseless. A monopoly is required for a standing army because competition is dangerous. A monopoly is not required for mortgage loans or car loans or credit cards but especially not mortgage loans because mortgage loans are the easiest loans to make. 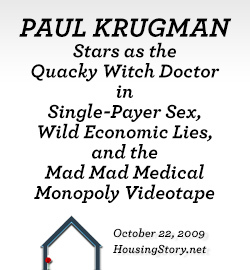 Have you ever seen anybody make the case that mortgage loans are so strange and dangerous and bizarre that we need a federally-granted monopoly for house lending? If you haven’t seen it, then every defense you have read of Fannie and Freddie was mindless ravings. Any valid defense depends upon proving the need for a monopoly. The proof doesn’t exist so those in favor talk about something else. Every writer of every argument I have seen, both conservative and liberal, has an excuse. A classic case in which we grant a monopoly is the case of war. You don’t want to have private players owning and managing standing armies because they might decide to use their assets to take over the country they were hired to defend. If we had five privately-held armies, how would they compete for more business? By killing each other? You give the government a monopoly on war. Everybody knows that this monopoly on war has an imperfect management technique. The military invented “Snafu” management. If mortgage loans are the easiest loans in the world to make, and if making mortgage loans are not the same as waging war or building two bridges right next to each other, then why do we give to mortgage banking the same legal exemption from competition that we give to the armed forces? One reason: Economists have cowered in the corner like spoiled children and failed to speak up and right this obvious clear misuse of regulation. I read a prominent voice the other day saying there was no proof Fannie & Freddie were a leading cause of the financial crisis. The question is complicated and I don’t pretend to know the answer about what exactly explains the origin of the financial crisis. Even if Fannie & Freddie are not leaders in the financial crisis — and you have to be way out there in the blue to say a $5 trillion institution is un-influential — the more important truth is that a government-approved monopoly breaks the first rule of economics. We broke a basic law of economics and now we fail to point out the obvious error and fix the obvious error. It’s like a doctor performing an autopsy on a person who has starved to death and listing organ failure as the cause of death. Yes, maybe it’s true, but the absence of food and water should be at the center of your attention. How do we provide food and water to the mortgage market? The right place to start is to kill Fannie and Freddie. Why? Because mortgage loans are easy to make and need no special powers granted by the federal government; namely the power of monopoly. The way that we kill Fannie & Freddie could be complicated. That we should kill them is simple and easy. Yes, kill Fannie and Freddie. Undo the mistake started over 70 years ago when we neglected fundamental questions about mortgage loans and monopolies. Bankers love mortgage loans because they are collateralized; because borrowers will lose shelter when they don’t pay and so they are highly motivated to pay; because repayment is assured by the income of the borrower and the value of the collateral; because they are written for large balances where one mortgage might equal 20 car loans or 200 credit cards; because they remain outstanding for years or decades. Bankers love mortgage loans. Therefore we committed a monstrous error when we broke the fundamental rule of free-market economics. The fundamental rule says — Break up monopolies so that competing enterprises will offer cheaper terms and better service to win business. With Fannie and Freddie, we didn’t break up a monopoly. We created a monopoly. Our regulators ignored settled economic law and created what they are obligated to stop and close and break up. It was backwards from day one. And every economist, both right and left, should denounce this sad failure. Conservative and liberal should be arm-in-arm on this, but that unanimity is not what we find in the real world. What could be the reason for dissent? Do Progressive economists now believe in a single-party state? Do they believe in central planning? Are they against competition? Are they in favor of the creation of monopolies when there is no need for the monopoly? Is this why everybody is confused about Fannie and Freddie? Are they embarrassed to admit in public that free markets are the great invention in the history of the war against poverty? You must wonder reader how many economists know mortgage loans are the easiest loans for a banker to make. My guess? Five percent of that population. And the percentage who have applied this knowledge to judge the future of Fannie & Freddie? Empty set. None. Nobody. Nobody has asked the fundamental questions whose obvious answers lead to obvious policies. The strangest thing in all defenses I have seen of Fannie and Freddie is that the defenses are looking at their role in the past and in the credit bubble. No defender asks the current question: Is it good that we have unlimited government funding available today to make mortgage loans after a radical property bust has sent private money running for the hills? The current price of real estate is still higher above trend than any previous bubble we have had in the last 120 years. Our efforts to stabilize prices are efforts to maintain bubble pricing. Now evaluate the intelligence of Bernanke and Geithner. Judge if we are fortunate to have Fannie & Freddie? 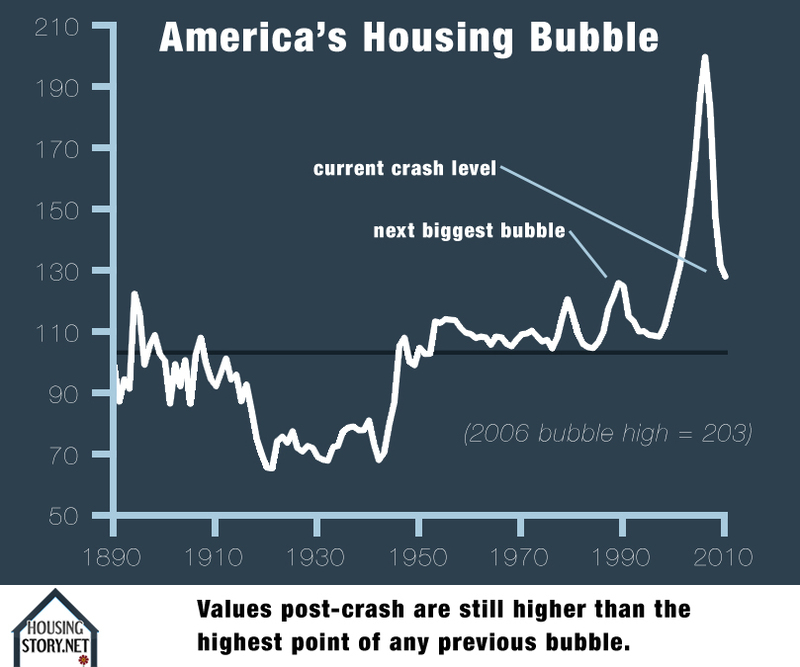 If you want the whole nation to pay much more than is necessary for housing, then we are home free and we have found our economic policy (Please see the chart above — “America’s Housing Bubble” — showing the current price of real estate is still higher than the highest point of any previous bubble.). Does having this public mortgage machine in place guarantee a greater tragedy? Are the affordable housing and crony job-bank and lobbying contracts worth it all? Do the apologists for Fannie and Freddie skip a defense of the current status of the mortgage giants because it is impossible to be anything but dumb in defending their current role? Is this underground fiscal stimulus smart when property prices are still above any previous bubble high? Bernanke and Geithner et al. are attempting to maintain bubble-level house prices at a time when American competitiveness is weak based upon the cost of labor. Maintaining bubble pricing will put American workers at a huge disadvantage in competing against China, India, the others. How can this be smart? Ordinary workers are hit with higher housing prices and they are hit by competing against poverty-level wages of developing-world workers. About 70 years ago a radical, ignoring economic law, fought and won a monopoly on mortgage lending for Fannie Mae. They ignored the key fact and principle – mortgage loans are easy to make and therefore economic law demands that no monopoly be given. Through time and chance this money machine unleashed five trillion of investment power. The money monopoly provided half of the funds needed to blow up a spectacular mortgage-and-property bubble greater by a factor of four than any previous bubble in the last 120 years of United States history. A financial collapse has thrown the world into panic. Prices have reversed radically. Even after collapse, house prices are still higher than any previous bubble. The Treasury and the Fed desperately want to support this bubble pricing. They can try to do it because a government monopoly in mortgage lending can be pushed and pulled in any direction. Losses are irrelevant. They are using somebody else’s money. At the same time everybody, but especially liberals, decry the falling income of the middle class. What is the biggest expense that class pays? Housing. And where is the federal government putting its full muscle? Fannie and Freddie, the monopoly established for affordable housing, is now putting its full faith and credit into propping up unaffordable housing prices. They are attacking the middle class. Go ahead and argue that Fannie and Freddie didn’t cause the crisis, but you can’t say they aren’t the leading players in continuing the crisis. 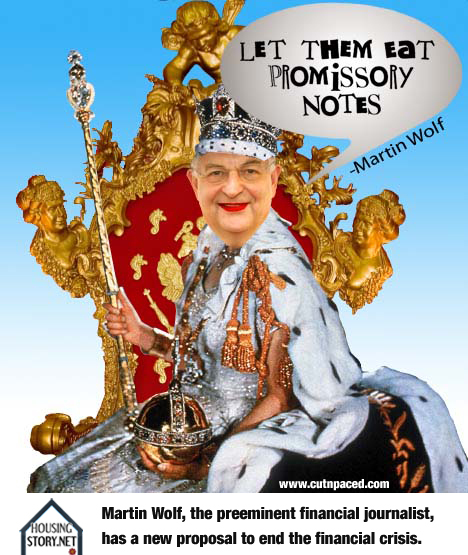 Some of you read Martin Wolf at the Financial Times. He is the most learned and ambitious weekly commentator on economics. He reads and understands every new paper. He takes on big jobs. He is constantly trying to answer the biggest and most difficult questions. As great as he is, I question whether he understands the basic definition of a financial crisis. Take a look first at his views on Andrew Mellon. I define a post credit-bubble economy as an economy strangled by a legacy of mania-fueled debts. You look back upon the mania and see huge sections of debt with no income to pay it back. This is the phony debt Mr. Mellon wants to liquidate. My theory for crisis management simply repeats Mr. Mellon’s plan. Liquidate rotten debt to bring the economy back in to balance. “How rotten is the United States economy?” you ask. 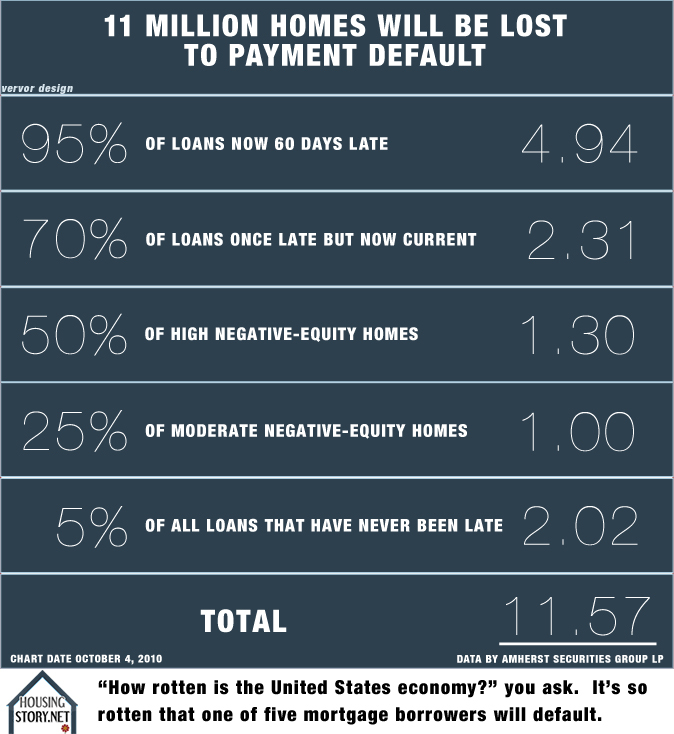 It’s so rotten that one of five mortgage borrowers will default (Please see the breakdown above of the one-in-five default ratio predicted by Amherst Mortgage Securities LP, one of the most respected mortgage analysts.). What happens if you pretend rotten bubble debt and rotten bubble-asset values are real? You are committed to a fantasy which promises to bring poverty and ruin on a magnificent scale. Do we know anybody like this? Yes, we do. Look at Japan — 20 years after their great real estate bubble. If we fail to liquidate our rotten debt, we will relive their paralysis. They have endured 20 years of torture by preserving rotten debt. What has become of Japan in the years since the end of their mammoth real estate bubble? Japan has had 20 years of zombie paralysis. The heavy weight of rotten bubble debt is still strangling them today. No, it’s worse. Their massive monetary and fiscal policy interventions have radically added to their debt balances. And the result? The Japanese economy has had zero growth in 20 years. Nothing. Zero. Completely useless. Does anybody argue in favor of a policy of no-growth for 20 years? Should we use massive fiscal and monetary intervention to increase debt when we are in a debt crisis? Does the drunk need a drink? The wayward pathetic Japanese eat sleep and suffer in Mr. Wolf’s stinking cave. Welcome to the land of feces and maggots. Mr. Wolf’s dismissal of Mr. Mellon’s cure proves there is some kind of hysteria-inducing Kool-Aid-drunk depraved group-think destroying the intelligence of Progressive economists. They know nothing and cannot lead. What should they learn? The cure isn’t the monetary policy of low interest rates. The cure isn’t the fiscal policy of deficit spending. It’s the debt policy. The choice is simple. Liquidate rotten debt or go zombie. Debt policy determines your success or failure after a financial crisis. All else is footnotes, forgery, imbecility. And what is the right debt policy? Liquidate. Liquidate. Liquidate. Property values blew up in the bubble four times higher above trend when compared to any previous bubble. Should our policy pretend this debt is valid and normal? Or we should we call this debt the product of irrational mania? 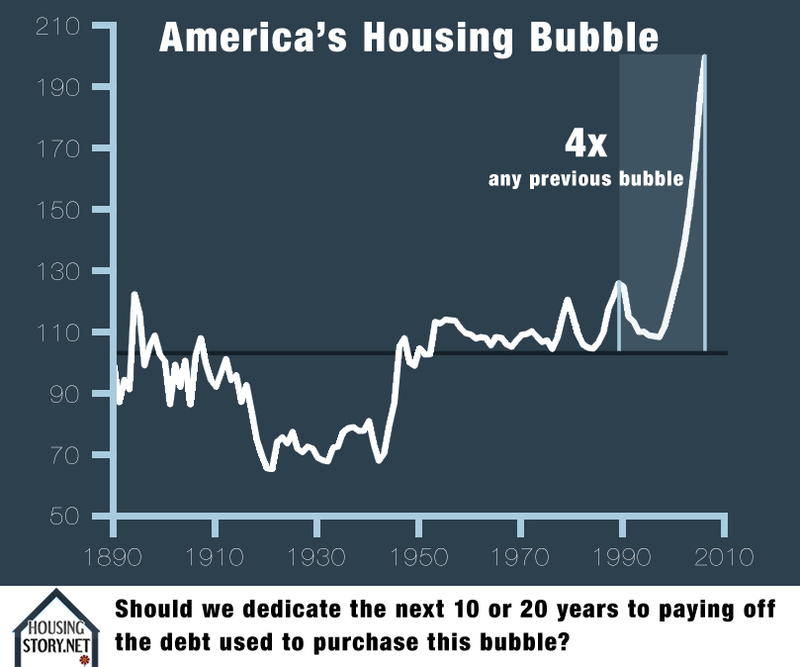 Should we dedicate the next 10 or 20 years to paying off the debt used to purchase this bubble (Please see the chart above showing the wild move up in housing prices.)? Or should we take a dagger to its heart and liquidate it now? The property bubble in the United States was radical and the worst we have had in 120 years. 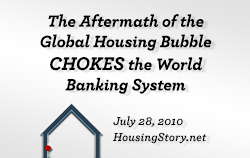 Many other leading economies are in housing bubbles even more extreme. 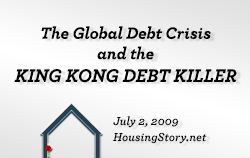 This is important because if you are buying a house today, you are taking on an asset and a debt in a global economy which has been radically mismanaged. The world can blow up into a mega depression at any time. I don’t pretend to understand all of the consequences of such a depression, but if it allows for writing off rotten bubble debt, then that is the medicine we must take. If all our choices are bad, let’s choose the bad which clears away the failure. Depression and mass bankruptcy – by individuals and companies and countries –are true cures of a credit bubble. Japan skipped a massive systemic bankruptcy and they are skipping recovery and they are skipping growth and they still keep digging a bigger and bigger hole for themselves. Our economic masters, with Mr. Wolf as their star director, are blind, deaf, and dumb to the true cure of this disease. Just look at Fannie and Freddie. They can’t get the money out the door fast enough. Fannie and Freddie are forcing us to walk backwards. Every day they reinforce a massive balance of consumer debt when the liquidation of existing unpayable debt is job one. Fannie and Freddie aren’t just supporting expensive housing prices, they are also the glue freezing us into a zombie economic paralysis. Does any of this qualify as an unintended consequence? Has the Liberal program of crisis management put us on the path to hell? How backwards is the world now? It is so backward that mortgage loans are no longer easy to make. The first rule of lending which has guided this argument is a lie. 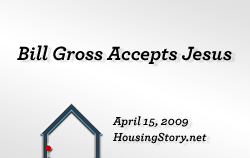 Mortgage loans are impossible to make now. They are dangerous. Property values have fallen 30%. Who says that they cannot fall another 30%? Who can say with confidence what the value of the loan collateral is? 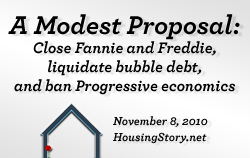 The Progressives finally have a perfect excuse today for Fannie and Freddie. Nobody can make mortgage loans anymore, not if they use their own money. If we don’t have Fannie and Freddie, property values in the United States will fall off a cliff and initiate global depression. We sometimes do need to invoke the power of the state to solve our problems. The state, through Fannie and Freddie, may logically be used to stop a global depression. That doesn’t mean it isn’t dumber than a box of rocks, but it has logic and the goal is massive and could not be more important. 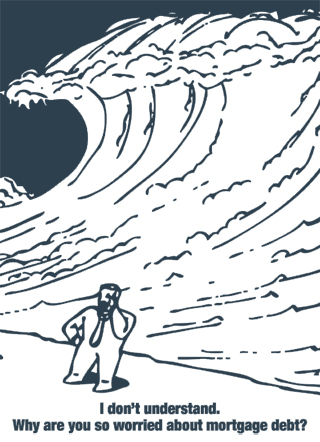 The better question: If we avoid global depression, do we guarantee a zombie global economy? Will the whole world resemble Japan? Any smutz off the street can act as a lender of last resort – which is the first job of a financial-crisis manager. In our case the Fed and the Treasury provided massive funding to the banking system. If you want to know the reason for this, imagine you had a ton of bills you couldn’t pay but you had the ability to borrow as much money as you wanted to pay your bills. That’s what the banks have. Nice setup if you can get it. The lender-of-last resort function is the first and easy job. After a massive credit bubble, you need to bring in your Superman economist to liquidate rotten debt as quickly and easily as The Man of Steel flies over tall buildings in a single bound. That work takes intelligence, courage, and ambition. Since these heroic efforts were missed the first time around, hell will break loose again. The debts haven’t changed. Not enough. Our credit-bubble persists. We are only a shock away from a new crisis. Fannie and Freddie reinforce our insolvency by constantly issuing new mortgage debt. Economists cower and know nothing. 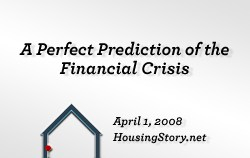 Pathetic fools argue Fannie and Freddie didn’t cause the crisis. The battle rages between deficit spending or not and zero interest rates or not and quantitative easing or not. Entitlements are protected. Deficits expand wildly. Debt is ignored. There’s no control. There’s no prediction. Confusion speaks loudly and carries the day. 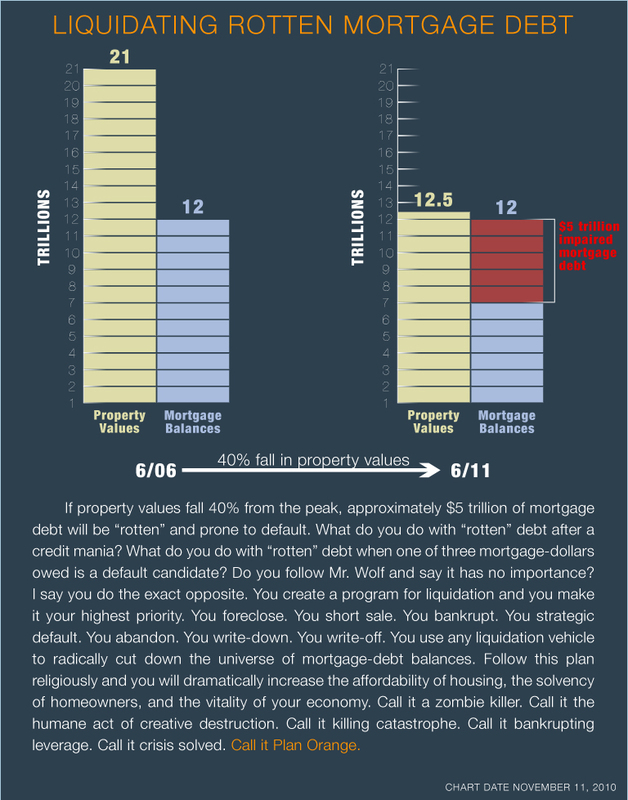 If property values fall 40% from the peak, approximately $5 trillion of mortgage debt will be “rotten” and prone to default. What do you do with “rotten” debt after a credit mania? What do you do with “rotten” debt when one of three mortgage-dollars owed is a default candidate? Do you follow Mr. Wolf and say it has no importance? I say you do the exact opposite. You create a program for liquidation and you make it your highest priority. You foreclose. You short sale. You bankrupt. You strategic default. You abandon. You write-down. You write-off. You use any liquidation vehicle to radically cut down the universe of mortgage-debt balances. Follow this plan religiously and you will dramatically increase the affordability of housing, the solvency of homeowners, and the vitality of our economy. Call it a zombie killer. Call it a humane act of creative destruction. Call it: “Killing catastrophe”. Call it: “Bankrupting leverage”. Call it “Crisis solved”. I call it “Plan Orange”. 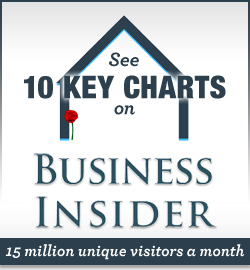 Thank you for carrying the story to The Automatic Earth, Business Insider, Patrick.net. 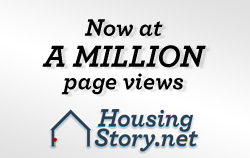 Michael David White is a nationwide mortgage originator based in Chicago.